Logging is an essential part of building backends and it is no different for a serverless API. It gives us visibility into how we are processing and responding to incoming requests. There are 2 types of logs we usually take for granted in a monolithic environment. Web server logs maintain a history of requests, in the order they took place. Each log entry contains the information about the request, including client IP address, request date/time, request path, HTTP code, bytes served, user agent, etc. Application logs are a file of events that are logged by the web application. It usually contains errors, warnings, and informational events. It could contain everything from unexpected function failures, to key events for understanding how users behave. In the serverless environment, we have lesser control over the underlying infrastructure, logging is the only way to acquire knowledge on how the application is performing. 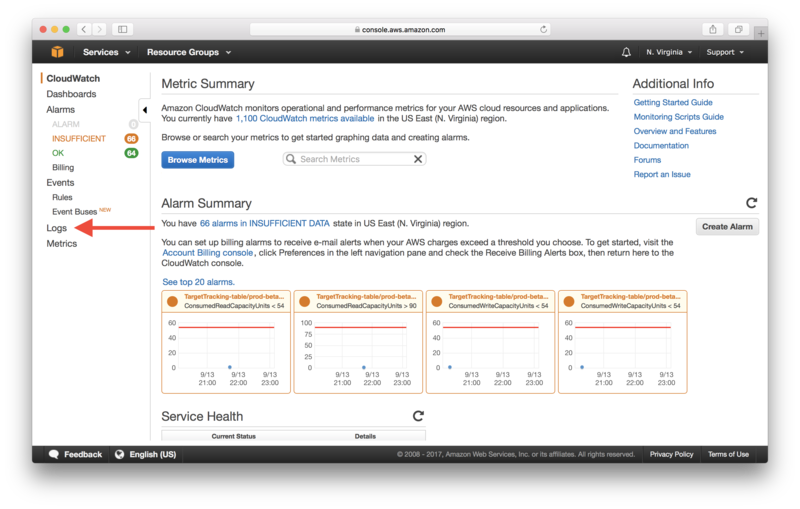 Amazon CloudWatch is a monitoring service to help you collect and track metrics for your resources. Using the analogy of server logs and application logs, you can roughly think of the API Gateway logs as your server logs and Lambda logs as your application logs. This is a two step process. 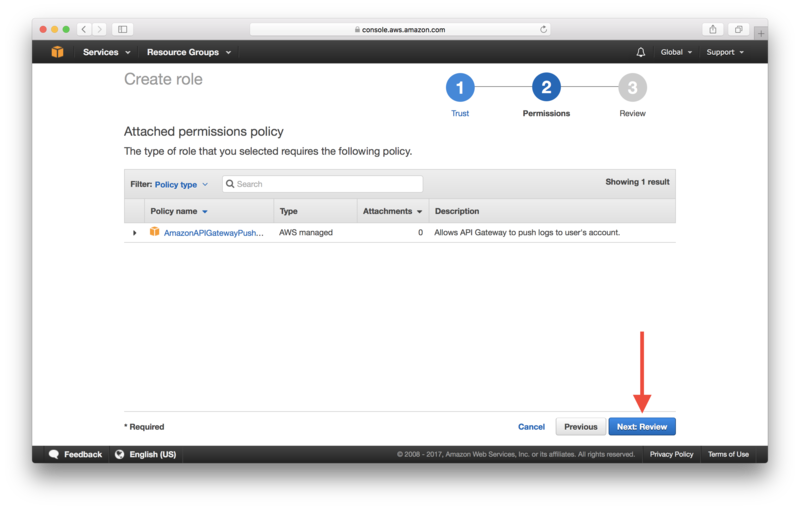 First, we need to create an IAM role that allows API Gateway to write logs in CloudWatch. Then we need to turn on logging for our API project. 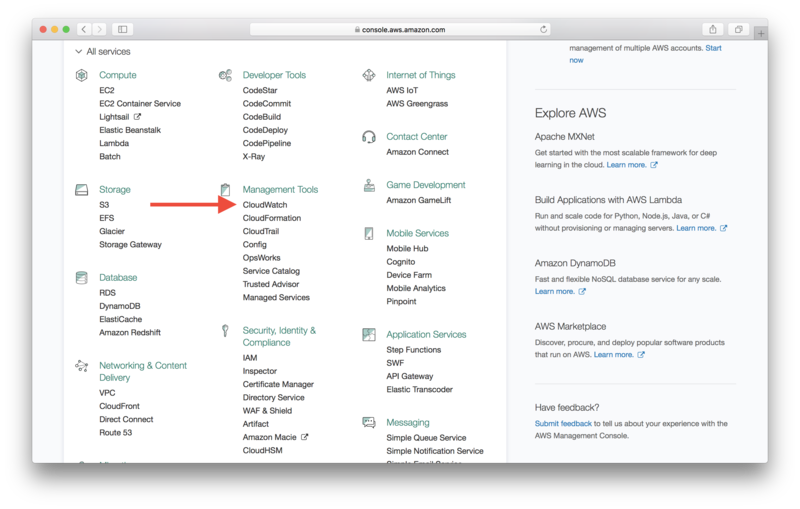 First, log in to your AWS Console and select IAM from the list of services. 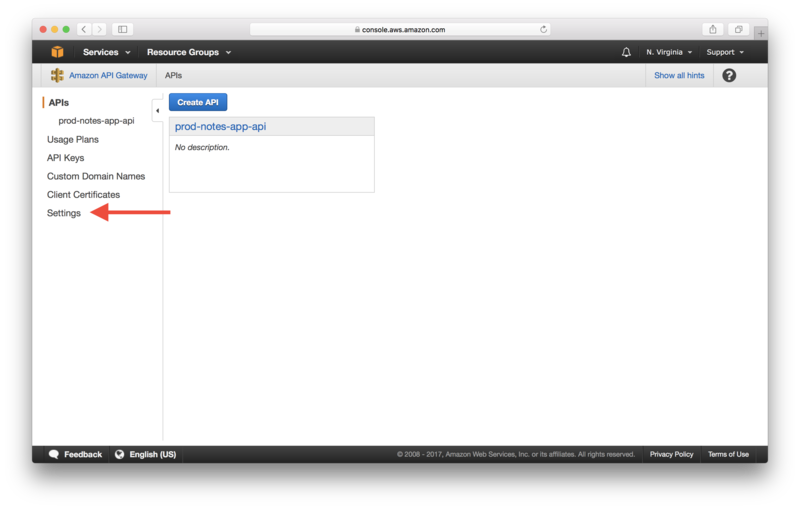 Under AWS service, select API Gateway. Enter a Role name and select Create role. In our case, we called our role APIGatewayCloudWatchLogs. Click on the role we just created. Take a note of the Role ARN. We will be needing this soon. 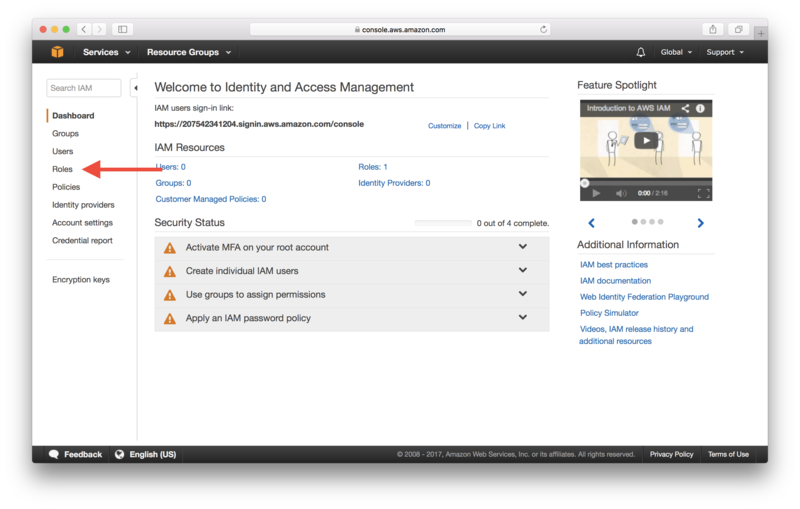 Now that we have created our IAM role, let’s turn on logging for our API Gateway project. Go back to your AWS Console and select API Gateway from the list of services. Select Settings from the left panel. 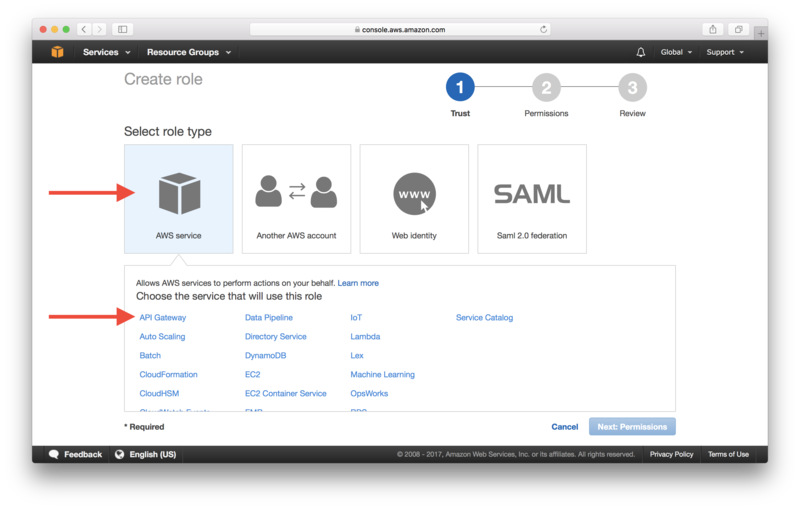 Enter the ARN of the IAM role we just created in the CloudWatch log role ARN field and hit Save. 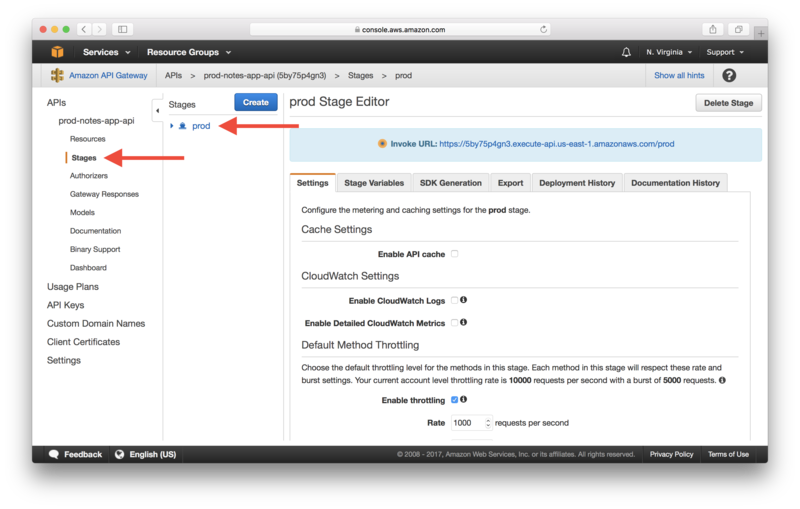 Select your API project from the left panel, select Stages, then pick the stage you want to enable logging for. For the case of our Notes App API, we deployed to the prod stage. Select INFO for Log level to log every request. Check Log full requests/responses data to include entire request and response body in the log. 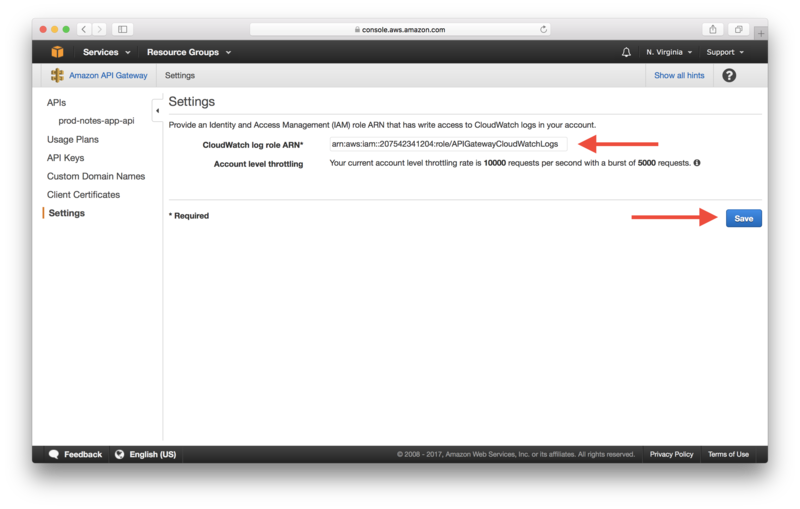 Check Enable Detailed CloudWatch Metrics to track latencies and errors in CloudWatch metrics. Scroll to the bottom of the page and click Save Changes. 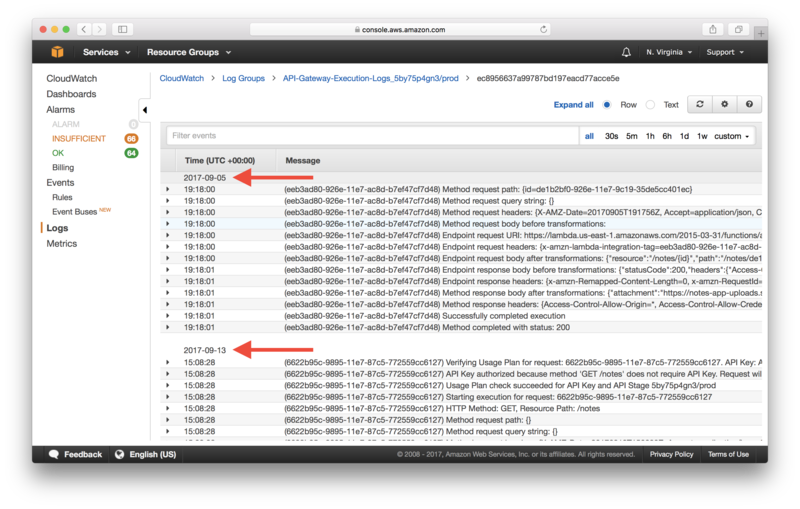 Now our API Gateway requests should be logged via CloudWatch. 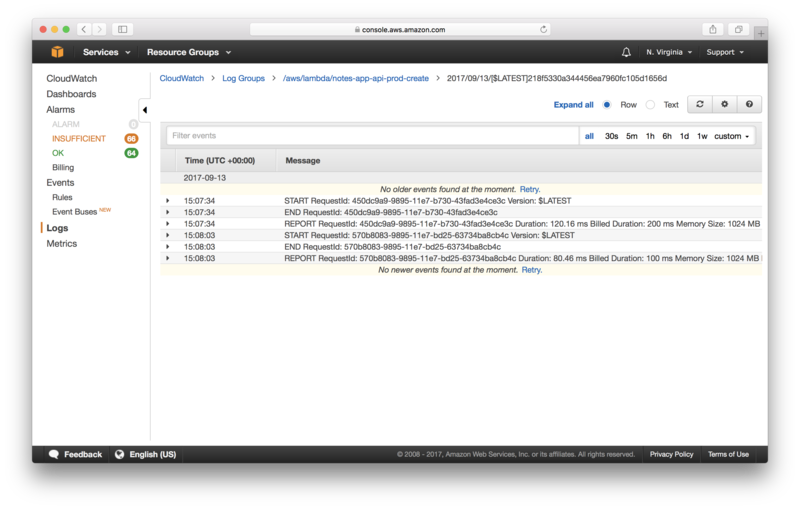 CloudWatch groups log entries into Log Groups and then further into Log Streams. Log Groups and Log Streams can mean different things for different AWS services. For API Gateway, when logging is first enabled in an API project’s stage, API Gateway creates 1 log group for the stage, and 300 log streams in the group ready to store log entries. API Gateway picks one of these streams when there is an incoming request. 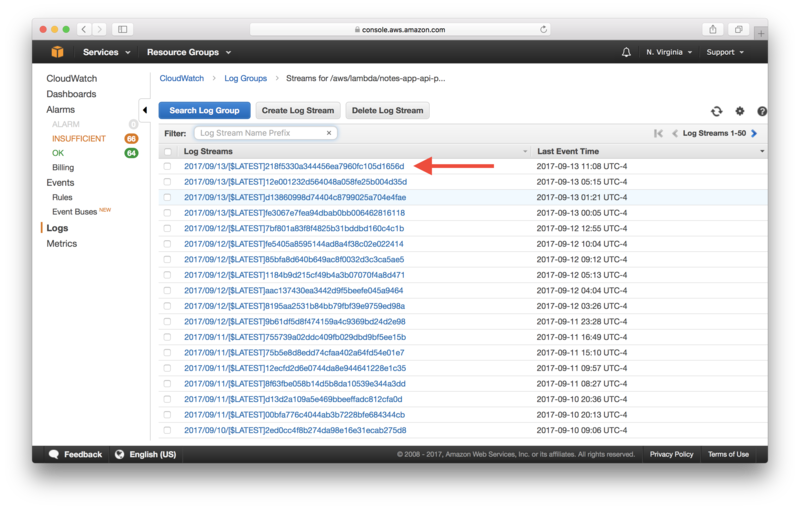 To view API Gateway logs, log in to your AWS Console and select CloudWatch from the list of services. Select Logs from the left panel. 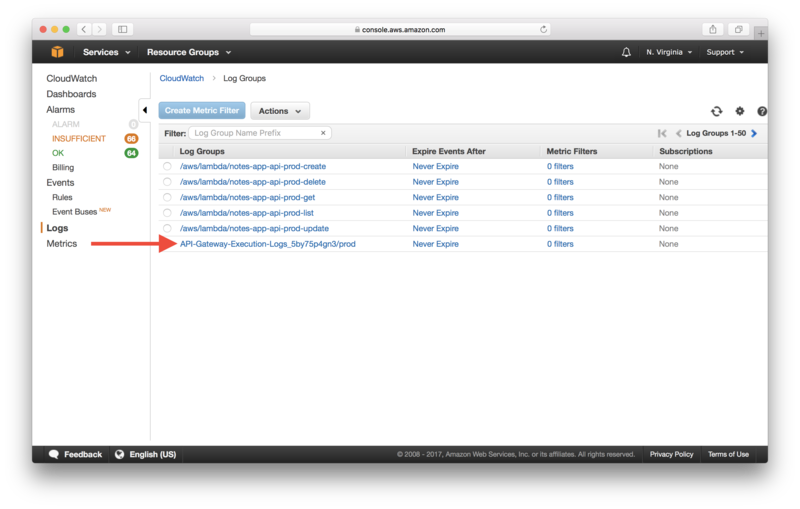 Select the log group prefixed with API-Gateway-Execution-Logs_ followed by the API Gateway id. You should see 300 log streams ordered by the last event time. This is the last time a request was recorded. Select the first stream. 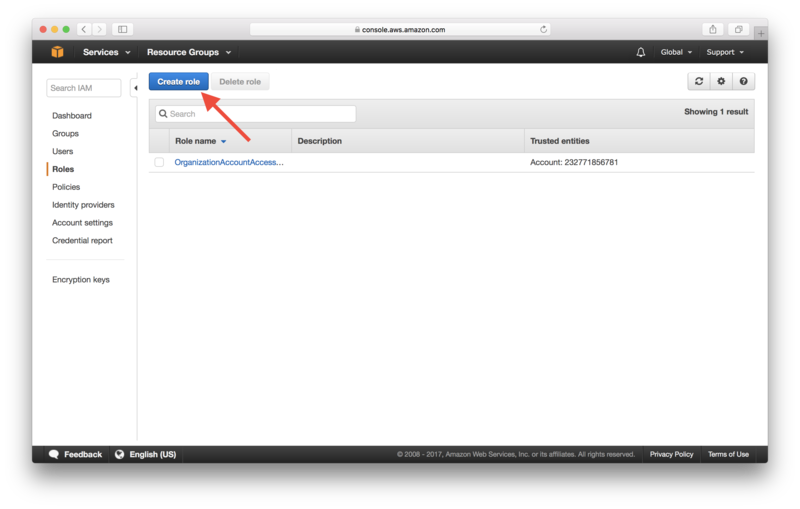 This shows you the log entries grouped by request. Note that two consecutive groups of logs are not necessarily two consecutive requests in real time. This is because there might be other requests that are processed in between these two that were picked up by one of the other log streams. For Lambda, each function has its own log group. And the log stream rotates if a new version of the Lambda function has been deployed or if it has been idle for some time. 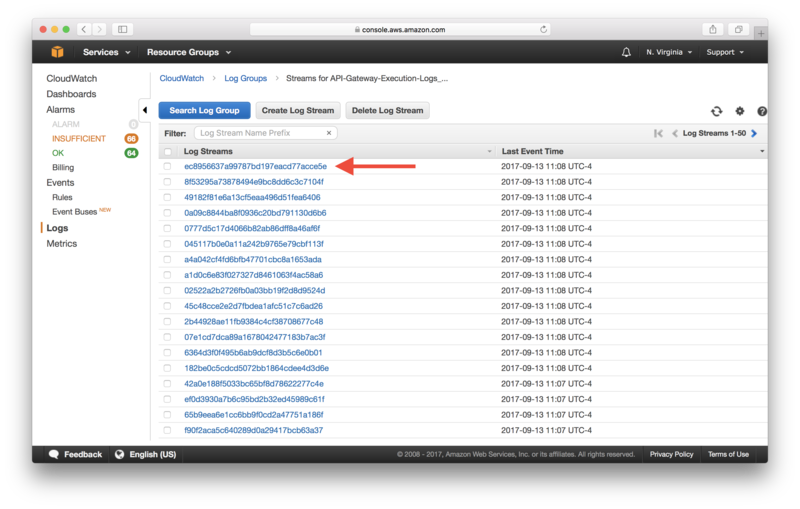 To view Lambda logs, select Logs again from the left panel. Then select the first log group prefixed with /aws/lambda/ followed by the function name. You should see START, END and REPORT with basic execution information for each function invocation. You can also see content logged via console.log in your Lambda code. 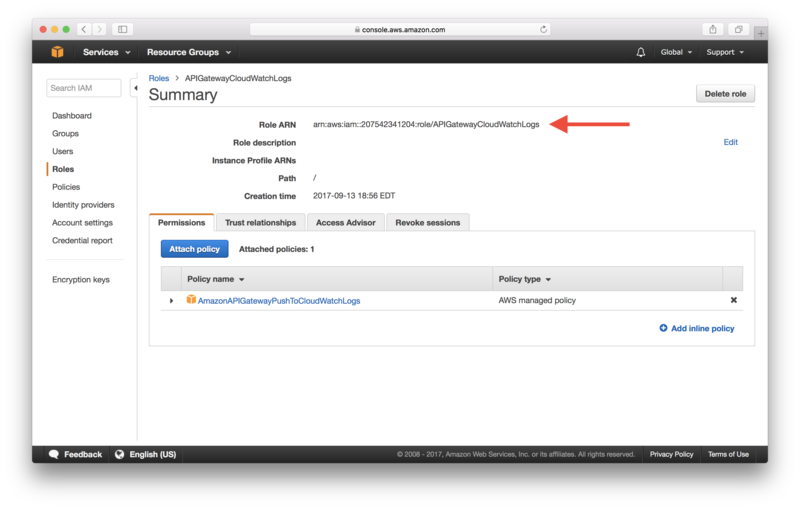 You can also use the Serverless CLI to view CloudWatch logs for a Lambda function. From your project root run the following. Where the <func-name> is the name of the Lambda function you are looking for. Additionally, you can use the --tail flag to stream the logs automatically to your console. This can be very helpful during development when trying to debug your functions using the console.log call. 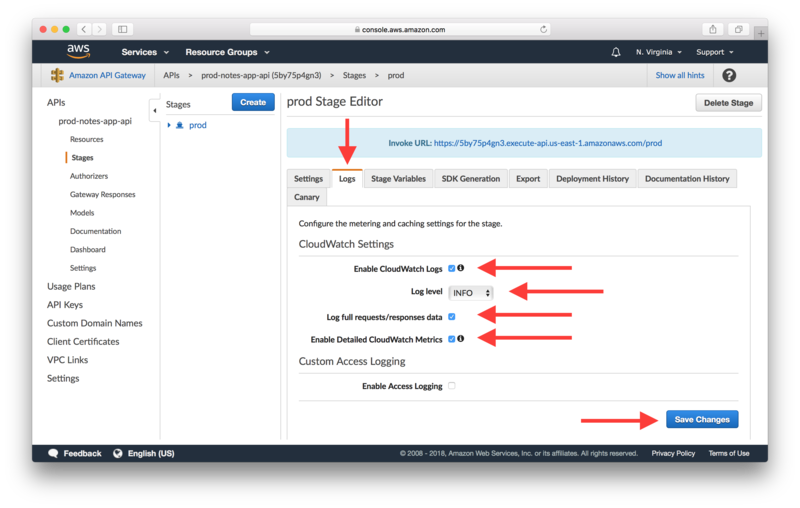 Hopefully, this has helped you set up CloudWatch logging for your API Gateway and Lambda projects. And given you a quick idea of how to read your serverless logs using the AWS Console.